At the beginning of the Paleogene, climate was still as warm or warmer than in the late Cretaceous. Analysis of vegetation has shown that continentality of climate increased eastwards. The decrease in rainfall was particularly strong. Kazakhstan and Central Asia had the highest heat supply with the paratropical landscapes developing between the eastern Caspian and the Aral regions since the very beginning of the period. After a cooler phase at the very end of the Paleocene and early Eocene, heat and moisture supply began to rise conspicuously and the highest level in the whole Cenozoic was attained at the time of the Eocene climatic optimum dated to about 53-50 Ma BP (Figure 2.12). The Eocene optimum featured not only a high global temperature (6°C above the modern one), but also equable climatic conditions all over Northern Eurasia with the temperature difference between the northernmost and southernmost regions being less than 10°C (Velichko et al, 1995). The highest temperatures occurred in the south-west of the East European plain where mean annual temperature was about 27°C and annual rainfall exceeded 1000 mm. The Eocene optimum marked the end of the preglacial stage of the Cenozoic. A gradual decrease in temperature began, with fluctuations superimposed on the general trend, opening the stage of progressive cooling of the landscapesphere. This new stage featured a few optima. However, they did not reach the level of the Eocene optimum and each subsequent optimum was cooler than the previous one. The second half of the Eocene and the early Oligocene were marked by a considerable decrease in global heat supply. As a result, temperatures in high latitudes dropped by 10-12°C and the first alpine glaciers developed in the Antarctic at the Eocene-Oligocene boundary (c. 38 Ma BP). A distinct cooling during the first half of the Oligocene has been recorded in the south-west of the East European plain (where it occurred during the marine transgressions and, therefore, did not feature abrupt fluctuations in temperature), in Siberia, Kazakhstan, and Central Asia. Apart from the decrease in temperatures of 8-10°C, annual rainfall decreased by 200 mm to 600 mm in Kazakhstan and Central Asia. The Neogene, including its first and longest Miocene stage (24.6-5.1 Ma BP), featured frequent climatic and landscape changes. Thus, despite general cooling, a distinct warming occurred about 21-20 Ma BP, as indicated by the presence of subtropical elements in floras, and another one occurred in the late Miocene about 11.3-10.3 Ma BP. 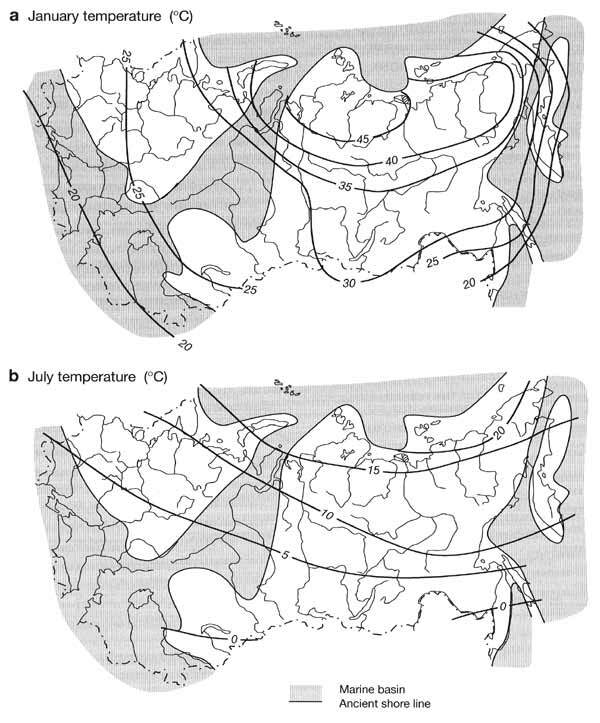 Both optima were well expressed on the East European plain (winter temperatures in the southern regions attained 8-10°C) and in Western Siberia where the first Miocene optimum was most pronounced. Later phases of the Miocene (beginning approximately from 9 Ma BP) were marked by a cooler climate and the progressive increase in aridity, especially in southern Western Siberia, where steppes, a new zonal component, developed. In the southernmost region, around Lake Balkhash, annual rainfall did not exceed 300 mm. These processes peaked about 6-5.5 Ma BP synchronously with the Messinian crisis. A cold temperate climate established across most of Northern Eurasia. During the first half of the Pliocene, the heat supply increased. In the south of the East European plain, winter temperatures gradually rose to 2-4°C as indicated by the presence of broad-leaved species in pollen spectra. In Western Siberia, cooling continued longer and the January temperatures were below -24°C until 4.9-4.4 Ma BP. Later they increased to 0-4°C at 56-57°N along with the increase in aridity as indicated by the dominance of dry steppe and desert vegetation associations. The occurrence of forests with a few broad-leaved species on the coastal plains of north-eastern Asia indicates that the region had a temperate humid climate. The period between 4.2 and 4.0 Ma BP is considered as the Pliocene climatic optimum. The second half of the Pliocene was characterized by climatic fluctuations at a lower thermal level and increasing aridity particularly during cooler episodes. Strong cooling of the middle Akchagylian, marked by a vast transgression of the Caspian Sea, presumably corresponded to the pre-Tiglian in Western Europe (2.7-2.1 Ma BP) and the onset of glaciation in Scandinavia (Velichko, 1973). Data on paleoflora in the south-west of the East European plain indicate that the January temperatures were as low as -10°C (Grichuk, 1981). Progressive cooling also occurred in Siberia where the January temperatures decreased to 16-18°C below zero and permafrost developed for the first time across the north-eastern regions. On the whole, the Pliocene was characterized by more frequent climatic fluctuations than the previous intervals and by restructuring of the landscape systems. Climatic cooling became stronger, especially after the Pliocene optimum which was the last one and had the lowest thermal level of the principal Cenozoic optima. Data for East European and West Siberian plains (the occurrence of forests of temperate-subtropical character in the west and dry steppes and semi-deserts in the east) indicate a sharp increase in continentality and aridity of climate eastwards. While the Miocene climates and landscapes may be considered as precursors of modern climates and landscapes, it was during the Pliocene that all the principal components of landscape developed, including the cryogenic phenomena. The Quaternary is subdivided into the Eopleistocene, Pleistocene, and Holocene. The Eopleistocene was the longest interval (1.6-0.7 Ma BP), yet climatic fluctuations were much less frequent than in the Pleistocene. Its characteristics are intermediate between the Pliocene and the Pleistocene. The well-studied sedimentary sequences in the southwest of the East European plain have revealed that at least two warm epochs, marked by high heat and moisture supply similar to those of the subtropics, occurred. Forest communities on red soils prevailed. The dry steppe landscapes, where loess material sedimentation occurred under the extremely arid conditions, were typical of the cold epochs in the south of the East European plain. A similar cryoarid stage with winter temperatures of about -30°C has been reconstructed for Western Siberia, although its correlation with the cold stages of the East European plain has not yet been fully established. Aridity could partly have resulted from sea ice formation in the Atlantic which blocked the principal source of moisture supply to the continental regions. Further east, in the Lena basin and in north-eastern Asia, sections dated to the Eopleistocene contain several generations of ice wedge polygons which indicate several cold intervals with a mean annual air temperature of about -5°C. Phases of cryogenesis alternated with much warmer intervals when permafrost degraded. The Pleistocene sequences have been studied most thoroughly on the East European plain, and most of the discussed reconstructions are based on the data from this region. Four climatic microcycles, consisting of four warm and four cold stages, occurred in the lower Pleistocene (700-400 Ka BP), which corresponds to the Cromerian in the West European schemes (Table 2.1). Analysis of vegetation has shown that the earlier warm epochs were almost as mild as those in the Eopleistocene. For example, in the south of the East European plain, the January temperatures exceeded 5°C (although in the north they were as low as -4°C) and the July temperature approached 25°C. Annual rainfall ranged between 600 mm and 800 mm. Throughout the lower Pleistocene,. 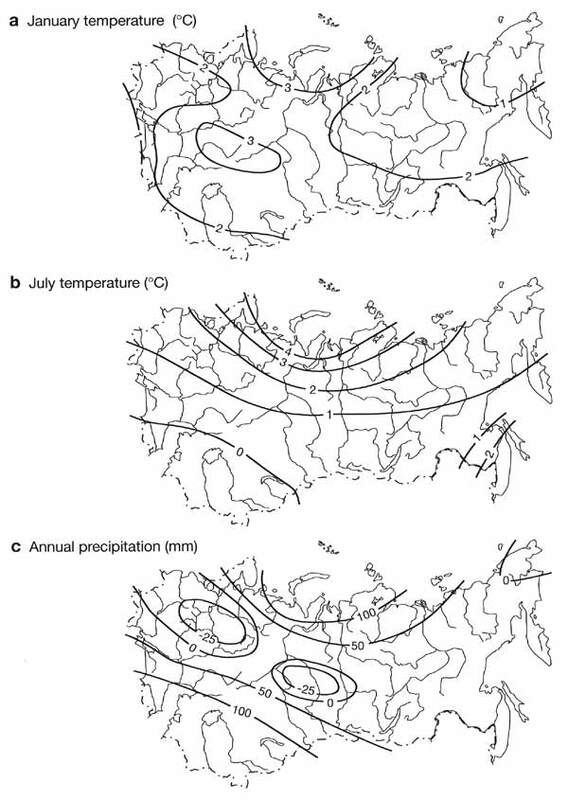 Siberia had a continental climate characterized by greater seasonal variability. During the first warm phase, temperatures varied between -15°C and -18°C in January and reached 18°C in July. A mild monsoon climate existed in the Far East, with high rainfall (about 800 mm) and the winter temperature decreased from -2°C or -3°C at the beginning of the interval to -16°C at the end. The middle Pleistocene began with an interglacial interval, known as the Likhvin in Eastern Europe and Tobolsk in Siberia, which has been studied in considerable detail. During its optimum, the winter temperatures were below zero (-2°C — -5°C) in the north of the East European plain and reached 1°C in the south, while the July temperatures ranged between 18°C and 24°C. 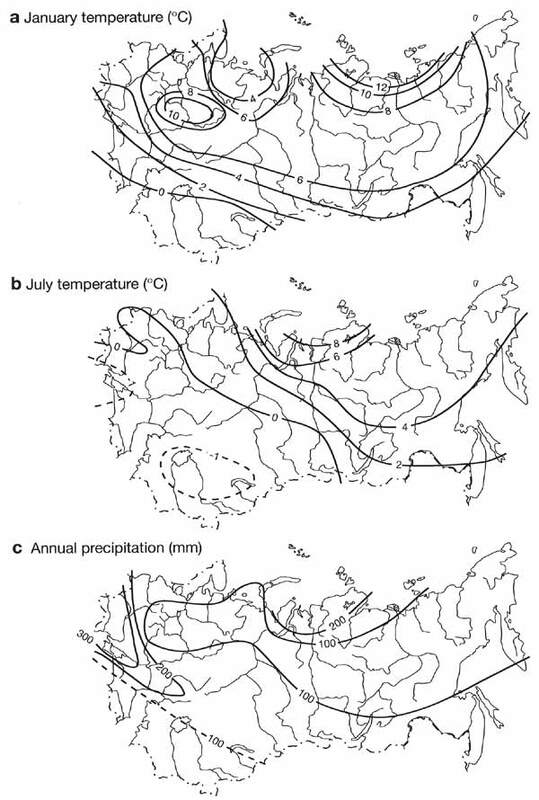 In Western Siberia, the January temperatures were between -11°C and -13°C, while in July they did not exceed 18°C. In the north-east of the continent, even during the warm phases, mean annual temperatures remained negative. This accounts for the development of permafrost, which has remained in the region ever since. Climatic fluctuations gained their maximum range during the late Pleistocene. This interval began with the Mikulino-Kazantsevo interglacial which was marked by the rise of global temperatures by about 2°C above modern values. In Northern Eurasia, thermal regimes strongly varied spatially (Figure 2.13). The January temperatures, for example, were slightly negative in the south of the East European plain, while in the north they were between -4°C and -6°C. In Western Siberia, winter temperatures were much lower: between -18°C and -20°C in the north and -12°C and -15°C in the south. The most pronounced deviations from the modern values (about +8°C to +12°C in winter and +6°C to +8°C in summer) have been reconstructed for the north of Western and Central Siberia. Warming was presumably accompanied by an increase in rainfall. In Central Asia and Kazakhstan, the interglacial optimum corresponded to the late Khazarian transgression of the Caspian Sea which was synchronous with the Boreal transgression of the northern seas (Table 2.1). There is evidence of a strong (8-10 m) rise in sea level and higher (up to 1000 mm) rainfall in the Far East. The subsequent cold epoch included the climatic minimum of the Pleistocene during which temperature decreased across the continent and the periglacial zone expanded greatly. Even in the south-west of the East European plain, where climate was usually mild, mean temperatures decreased to -30°C in winter and to about 16°C in summer. A distinct climatic minimum has been recorded in the monsoon regions of the Far East where the mean annual temperature dropped by almost 10°C and rainfall decreased to 400-500 mm. The late glacial stage was marked by a series of sharp fluctuations which occurred against the background of climatic warming, whose range gradually became smaller towards the post-glacial Holocene optimum. A warming of an interglacial type, which occurred in the Holocene, also proceeded as a sequence of warmer and colder phases. Paleobotanical data suggest that the first conspicuous shift towards warmer conditions occurred in the Boreal (9-8 Ka BP). However, this warm phase was not the major one in the majority of high and mid-latitude regions. Only a few regions featured temperatures similar to the modern ones. The principal warming occurred in the late Atlantic (5500-5000 years BP) and was marked by a 3-4°C rise in both winter and summer temperatures. The mean global temperature was about 1°C above the modern one (Figure 2.14). Climatic cooling has been the principal trend between the Holocene optimum and the present time, although a few warmer phases have been identified (e.g., the Subboreal between 4000 and 3500 years BP and the medieval climatic optimum in the llth and 12th centuries).